Neither WordPress or WooCommerce have the ability to set an expiration date for a post, custom post type, page, or a product. In the past, I bought two different plugins in order to provide the ability to set an expiration date on WooCommerce product. But I just discovered today that there is a free plugin that allows you to specify WooCommerce Expiring Products. Plus it also allows you to specify expiration dates for posts, custom post types, and pages. 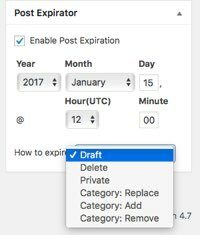 Post Expirator, a free WordPress plugin, provides the ability to set an expiration date for any post, custom post type, or page. And it’s very easy to use. Download Install the Post Expirator plugin. How to install WordPress plugins. Once the Post Expirator plugin is installed and activated, all posts, custom post types, pages, and WooCommerce products will display an expiration box on the editor page. Configure Post Expirator: Go to Settings > Post Expirator. There are many settings, but you can probably go with the default. However, one setting stands out: you can enable or disable Post Expirator for posts, custom post types, and pages. Open a WooCommerce product or any post type or page where you want to set an expiration date. Check Enable Post Expiration to activate the Post Expirator. Set the expiration time and date. Select an expiration method from the How to Expire list. The default is to change the post from published to draft. But you can also delete the post, change it to private, or replace the post’s category. Click Update and you’re done. Bonus Tip: You can add the expiration date to the post using this shortcode: [postexpirator]. Also, in the settings, you can enable a post footer with a customizable expiration message. Bottom Line: This is a very useful and amazing free plugin for setting the expiration date on a post, custom post, page, or WooCommerce product, with lots of customization settings.